Boian Mitov from Mitov Software has an interesting suite of components called LogicLab for Delphi XE6 Firemonkey. LogicLab allows you to simulate and display logic conditions using tools like logic operators, segment decoders, binary encoding & decoding, ALU & magnitude comparer, and more. Logic operations can be performed with little or no code using these components and OpenWire. LogicLab is a commercial component suite which runs on Android and Windows with IOS support in beta. It makes use of an open source component suite and Delphi IDE add on called OpenWire which is also from Mitov Software. Here is a list of components that come with LogicLab and which you can use to define logic with OpenWire: LLOr, LLAnd, LLXor, LLInverter, LLTFlipFlop, LLSource, LLSink, LLRandomGenerator, LLMerger, LLSplitter, LLJKFlipFlop, LLRam, LLRom, LLSegmentDecoder, LLDecoder, LLEncoder, LLFromGrayCode, LLToGrayCode, LLBinaryCounter, LLBitShifter, LLBarrelShifter, LLMultiplexer, LLDemultiplexer, LLMagnitudeComparer, LLAdder, and LLALU. For more information on what each component does check out the Components page after the jump. 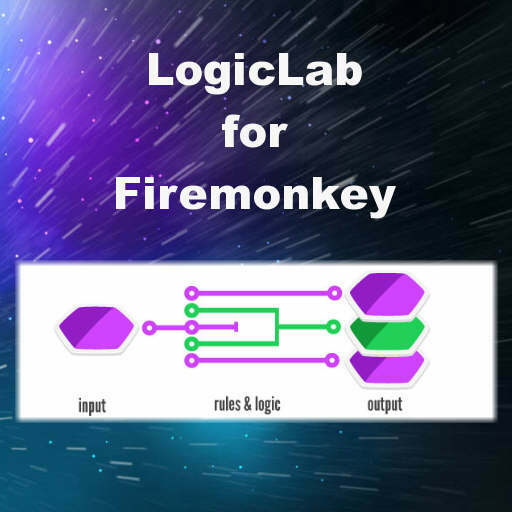 Head over and download the full LogicLab component suite and start utilizing it in your Firemonkey apps.